My name is C/Sgt Watchman V. Watchman is a military mascot of the now disbanded Staffordshire Regiment and the now withdrawn 3rd Battalion (The Staffords) of the Mercian Regiment. I am a Staffordshire Bull Terrier. I continue my duties as part of the Staffordshire Regimental Association. A Watchman mascot is usually gifted by the people of Burton-on Trent to the Staffordshire Regimental Association, previously the Staffordshire Regiment's. Previous Watchman also paraded with the West Midlands Regiment and related reserve regiments. The mascots family line comes from Cannock, in Staffordshire. Each successive mascot carries the name Watchman. When a mascot dies or a handler retires, another Staffordshire Bull Terrier puppy is chosen to replace him. When a Watchman passes away, they are buried with full military honours in St Edwards Square in Burton upon Trent, Staffordshire. The Regiments of Staffordshire have had a Staffordshire Bull Terrier as their mascot since 1882. The Watchman name is a modern addition to the tradition, started after the Second World War. There have been five Watchman since 1949, the current mascot is Sgt Watchman V, who took up his duties on 5th October 2009. The Watchman have been a popular mascot of the Staffordshire Regiment and has attracted much public interest. We hold the Freedom of many Staffordshire towns (or boroughs) including Tamworth and Newcastle under Lyme borough's. Since the Staffordshire Regiment was disbanded and merged into the Mercian Regiment in 2007, we carried out ours duties as part of the 3rd Battalion (The Staffords) of the Mercian Regiment. After the 3rd Battalion (The Staffords) was withdrawn and merged into 1st and 2nd Battalion of the Mercian Regiment, I carry out my duties as mascot to the Staffordshire Regimental Association..
Watchman is classified as a regimental pet and was not recognised by the Army or the Mercian Regiment. Since he is an unofficial mascot, his upkeep is paid for by the Staffordshire Regimental Association, not by the government or Mercian Regiment. I normally marches at events featuring the Staffordshire Regimental Association or where he has been granted Freedom of the town or village. Although I often attend many public events, military ceremonies and regimental funerals in his own right. The tradition of the Regiments of Staffordshire having a Staffordshire Bull Terries as a mascot started in 19th Century. In 1882 The South Staffordshire Regiment received orders to march with Lord Wolseley to the relief of General Gordon. His forces were besieged in Khartoum. The Regiment boarded trains in Cairo with their Staffordshire Bull Terrier “Boxer”. However after the engines were started the train began to move the noise startled boxer, who leapt from the moving train and fell to the track. He was last seen by the men lying dead or unconscious at the side of the track. From this point onwards the regiment adopted the tradition of a Bull Terrier as a mascot. This continued with the battalions until after the Second World War. After the Second World War the tradition changed to include mascot carrying the name "Watchman". The first Watchman, Watchman I, was presented to the 6th Battalion the North Staffordshire Regiment in 1949. They received their new mascot for being the highest recruited infantry battalion in the Territorial Army. Watchman I was all white. Watchman began his duties and accompanied the regiment to the Royal Tournament in Olympia on 25th May 1949. Watchman I showed little interest in the event until the band and drums struck up and began playing. Upon hearing this Watchman I raised his head and began to march to wide public applause. Over the next ten year of service Watchman I took park in every parade with the battalion. Watchman I was presented to Her Majesty The Queen during a royal visit to Burton-on-Trent on 28th March 1957. Watchman I died in 1959 and was buried in King Edward Square Burton-on-Trent. Unknown be known at the time, the future burial ground of Watchman II, III & IV. The popular public affection for Watchman I, along with the established tradition, interest and popular feeling of the people of Burton towards him resulted in Watchman II being presented to the Regiment in September 1960. Watchman II was a gift from the town of Burton upon Trent at a civic parade. Watchman II matched at the head of the battalion for the next six years. He was presented to Her Majesty The Queen on the occasion of the Presentation of New Colours to the 6th North Staffords and 5th South Staffords, and a Guidon to the Staffordshire Yeomanry at Molineaux in the early 1960s. Watchman II toot part in the Honorary Colonels Parade held at St Martins Camp in 1966, which was too be his last parade. In 1967 the County Territorial Army Regiments were reformed. This meant Watchman II went into retirement until his death in 1974, aged fourteen years old. He was buried alongside Watchman I in St Edwards Square, with a commemorative plaque placed onsite. Following the death of Watchman II, the regimental family felt that the time honored tradition mascot should continue. After a search to find a dog of the correct pedigree the town of Burton upon Trent again presented the Regiment with a new mascot, Watchman III, in 1988. Watchman III went on to serve until his death 1998. He was buried alongside Watchman I & Watchman II in St Edwards Square, Burton upon Trent. Watchman IV was presented to the Staffordshire Regiment in August 1998. He was a gift from Friends of the Regiment. Watchman IV praded with the 1st Battalion of the Staffordshire Regiment and the West Midlands Regiment. His handler was Malcom Bower. Watchman IV appeared at remembrance day parades in London and the Service of Remembrance outside Westminster Abbey. At this event he was introduced to HM The Queen. He participated in the Tercentenary Celebration in 2005 and Watchman IV was again was introduced to HM The Queen at the Stafford's 800th anniversary celebrations in 2006. Watchman IV attracted such attention when his handler took him for a walk through the streets of London. A coach full of tourists pulled up and leapt off the vehicle to photograph him. Watchman IV was carried forward when the Battalion joined the Mercian Regiment on 1 September 2007 and became the mascot of the 3rd Battalion The Mercian Regiment (The Staffords). He retired on 4 October 2009 after 10 years of military service. He was replaced by a young Staffordshire Bull Terrier named Watchman V, in a ceremony at the Staffordshire Regiment Museum in Whittington, on 5 October 2010. Watchman IV was buried with full military honours in St Edwards Square in Burton upon Trent on 5th December 2013. He rests along previous Watchman I, II & III. I took over duties on October 5th 2009. I carry out my duties as part of the 3rd Battalion (the Stafford's) of the Mercian Regiment, until it was withdrawn in 2013. I then took out duties as part of the Staffordshire Regimental Association. My handler is Greg Hedges. I attend regimental events, military parades, remembrance ceremonies and national events such as the Garden of Remembrance at Westminster Abbey. I has been presented to HRH Prince Harry at the Garden of Remembrance in Westminster Abbey. I have also been introduced several times to HRH Prince Philip at the Garden of Remembrance in Westminster Abbey. Like previous Watchman I have proved to be a very popular mascot and I was awarded Freedom of numerous villages and several towns in Staffordshire, most notably Tamworth Borough in 2014 and Newcastle under Lyme Borough in 2016. As part of the Regimental Association I also holds freedom of many other places such as Hednesford, Cannock, and Hanley, in Stoke on Trent. The granting of Freedom to me, my handler and our successors, by several major towns in Staffordshire was part of a campaign by Staffordshire politicians to ensure the Watchman tradition continues, now the 3rd Battalion of the Mercian Regiment had been withdrawn and the Staffordshire Regiment has been disbanded. 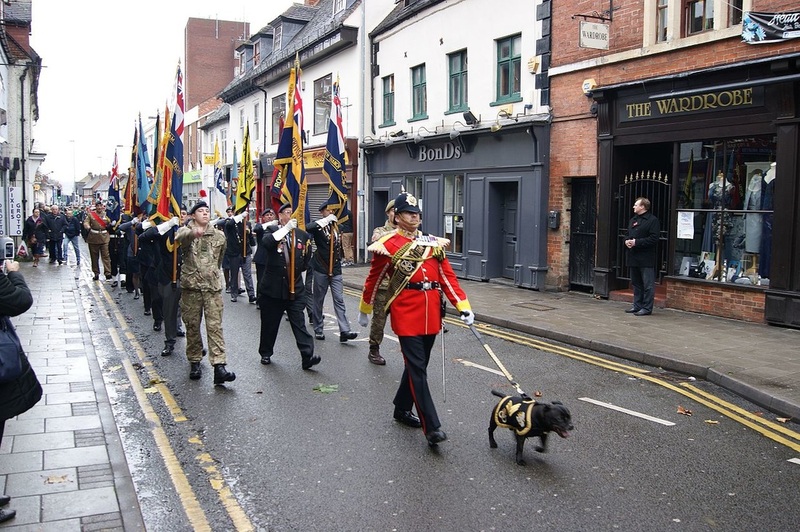 Such was the pride and affection for the Watchman, the civic community also wanted to ensure he could continue to parade with the Mercian Regiment in their own towns, as he is not their official mascot. In 2016 I was entered into the “Westminster Dog of the Year” competition by Staffordshire MPs Amanda Milling, Christopher Pincher, Jeremy Lefory, Andrew Griffiths, Gavin Williamson, Michael Fabricant. It was the first time a military mascot has been entered into the competition. The MPs organised a public campaign to help me win the public vote element of the competition. The final was held in Victoria Tower Gardens on Thursday 8 September. I won the public vote in the competition and was crowned the 2016 competitions "paw-blic" vote winner. In October 2016 my handler, Greg Hedges, was shortlisted for the Express and Star "Big Thank You" awards in the Ambassador of the year category. The winner, chosen by a public vote, is announced in March 2017.